Glass beads, like the ones that I make at Dragonfly Organics, represent a relatively new process of bead making (especially when compared to ancient beads like the ones above). In their time they were considered attractive and precious objects, just like our contemporary jewelry, but they were made from softer materials like sea shell, egg shell, bone, ivory, teeth, claystone, shale, etc. Even pine nuts, fruit pits and seeds were used as beads. But some early cultures, also made them out of extremely hard materials like jade. These would be perforated through the middle and strung together for a variety of purposes. Beads were used to express and elaborate personal identity for a large part of human history. Early dates for the use of beads range somewhere between 33,000 to 45,000 years ago from estimates of an early Later Stone Age stratum in Border Cave in South Africa. Even Neanderthals are known to have made and used beads. Some of the earliest beads may have been worn to represent a social group rather than the individual. But whatever they were meant to convey in the beginning they certainly became an individual ornamentation as early as the Aurignacian period in Europe. What is most striking is the care they took to create an artistically unique item for adornment. Randy White of New York University has studied over 18,000 Aurignacian beads. 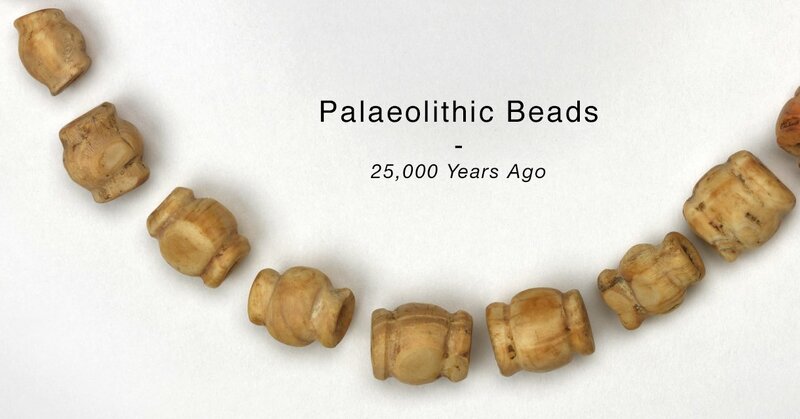 These beads would date to somewhere between 32,000 and 28,000 years ago. By this time these people were choosing exotic materials away from their local territory to make their beads. If they lived in an area where ivory was available they used something from another area such as sea shells and someone in an area of sea shells might use ivory to make their beads. The idea was to make them as interesting and unique as possible. In North America the earliest beads date to approximately 11,000 years ago within the Folsom culture. Beads were made throughout the archaeological record in this part of the world. In the southwestern U.S. the Desert people wore necklaces as their most popular pieces of jewelry, even before glass trade beads became widely available. In Mexico, bead making reached its highest skill level within some of the Late Stone Age cultures like the Aztec. They used many hard stones, the hardest of which was jade. These large organized societies were able to support craftsman who worked within specialized trades such as jewelry making. Next week we will look at one of the biggest sites for Palaeolithic bead discovery, Poverty Point, in the lower Mississippi Valley. The finds are truly incredible!